As a kind of unicorn chaser to the very expensive Un Coeur en Mai I discussed on Tuesday, today I'm looking at a couple of guilt-free bargains from Les Garçonnes, the most recent collection of "CrazySticks" from Crazylibellule and The Poppies. They've recently* raised the price of these (adorable) solid twist-up perfumes, but the jump from $16 to $18 is one I can live with. My hands down favorite of the new bunch is Chère Louise, which was reportedly inspired by silent film actress Louise Brooks. It's a lovely darkish woods (the notes: hyacinth, rose, pepper, iris, saffron, patchouli and gaiac wood). The hyacinth and rose stand out most in the very opening, after that, it's mostly about the woods (Louise or no, I think a man could easily wear this). It's slightly peppery, with a very clean patchouli, and the iris and saffron together add a soft, creamy spiciness. It's not quite in the wood pudding category, but very nearly. My overall favorite of the Crazylibellule line is still the wonderful Encens Mystic (from the Shanghaijava collection), but Chère Louise is a close second. It's probably more of a cool weather than a warm weather scent, but given the incredibly temperate weather we're having this summer, I've found it perfectly fine to wear in July. I would swear it smells just like some other scent that I can't pinpoint, but for $18, who cares? Hommage à Gabrielle is a tribute to Gabrielle "Coco" Chanel. On first sniff, it didn't interest me much — a pale floral, pretty enough but not that interesting — but the dry down is lovely: a woody incense lightly sweetened with vanilla. The longer it's on skin, the more I like it. Enough vague, sort-of-jasminey floral lingers on to render this one more feminine than the Chère Louise, and it's light enough that I should think you could wear it in any weather. Crazylibellule and The Poppies Chère Louise and Hommage à Gabrielle were developed by perfumer Olivia Jan and are available in 5 gr perfume solid; $18 each. They stay fairly close to the skin, and they do leave a waxy residue — it doesn't bother me in the least, but if it would bother you, consider yourself warned. For buying information, see the listing for Crazylibellule and The Poppies under Perfume Houses. * At least, I assume it was recently. I haven't really been paying attention. Note: images of Louise Brooks and Coco Chanel via Wikimedia Commons. migrating over from the discussion of Cacharel’s dubious-tactic ad: I would bet these cute but very lovely containers, with their air of ease *and* sophistication, could appeal to a lot of teens. The packaging appeals to me, though, and I am far from my teen days… your description of their Encens is very compelling. I have to go to Anthropologie to purchase a wedding gift, so I will check to see if they carry the line. I don’t like solids too much, but these do sound lovely. Thanks R! I like solids, esp. when I want portability or minimal sillage. Best solid ever: Fracas! No way! I have never seen a Fracas solid. Mine is much older (and less fancy) than that…a very kind person who said she never used it sent it to me. Smells fabulous. Harvey Nichols has it! £45 and no doubt worth every cent. The solid is easier to wear if you find Fracas in the spray EdP overwhelming…the solid stays closer to the skin, and it’s easier to control the amount you apply. Mine appears to be very old but has kept its fragrance remarkably well. oh yes, Anthropologie would make a lot of sense–these fit their aesthetic to a T, I would think. I’ll check Sephora as well—thanks for the info, all! I don’t know about these latest releases, but my Sephora carries some (at least right now). They were with other travel size or bargain buy products, rather than fragrances, though. Hello fellow SF-er. Sephora does have some of the Crazy Libellule but I don’t see these on the website yet. I want someone to carry the cologne they came out with – 26 Juin Iles d’ Yeu Splash & Spray Cologne, It’s not that expensive but I really want to sniff it. It sounds really refreshing. Ah, but you can buy a sample of that one, right? Course, that costs $. I don’t know – I guess I have to look harder – it is not sold in my usual places. Oh, wait — that’s the new one. B-glowing has samples for $4 each. I found some quite easily on eBay for $8 each and was very excited to have done so. However the perfme – yuck! I excitely tried it, waiting a whole day for post-shower fresh skin, only to find it stinks of cheap soap. I picked up not a hint of floral anything and certainly not rose. Perhaps mine had spoiled? They’ve been out of business a couple years I think…so wonder if some of the scent has faded? Must be! I got three more in the post today – Gabrielle, Jeanne, and Gardenia and they are all three lovely! I might try again with Louise. Ack, never mind — I found them, they’re there! And yes, $16! Cute tote bag too. I don’t know if anybody has these yet except B-glowing, but I’m sure they will eventually. Ozonic flower!! And I always wonder if that’s the sort of thing that would be more noticeable in a liquid w/ better sillage…it’s not massively fresh to me. Chere Louise sounds wonderful to me, and you can hardly go wrong with the price. I was in an Anthropologie last week and (of course) was perusing the fragrances, but did not see these. I know they used to carry this line. Yes, they did, and I do like the Gin & Rosewater … I was intrigued too by the Tokyo Milk soaps … they smelled great, and all the Tokyo Milk products have such great packaging! i got the citrus scented Tokyo Milk soap (can’t remember name). it smells heavenly in the bathroom, but it doesn’t transfer onto the skin at all (tocca soaps OTH leaves a subtle trace of fragrance). i was a little disappointed but you can’t go wrong with the price and the cute hand-stamping. Interesting … they smelled so good through the packaging I thought the scent would probably stay on the skin pretty well! Thanks for the info. I’d buy one just to scent the bathroom or bedroom I think! Thanks Scentsitive! I don’t mind if the soap doesn’t scent the skin so long as it smells good while I’m using it — and so long as it’s cheap! Oh rats. I walked right past one the other day and thought “wasn’t there something I wanted to see in that store?” Couldn’t begin to think what it was though, so passed right on by. Ah well…my unsampled sample stash is out of hand atm anyway. It’s probably best you didn’t go in … it was all I could do to drag myself out of there without buying anything! Oh, these sound like a lot of fun and that cute bag really does cinch it for me. It is a fun line…the packaging is just as cute in person, although they’re smaller than you might imagine. I schmeared on a TON of the Chere Louise and it made it through about 4-5 hours, maybe? The Gabrielle I don’t think made it so long. Lasting power isn’t a huge issue with me though — I like things to fade away so I can wear something else. Sometimes I’m impatient too for something to fade – or I hate it and want to get rid of it fast. I’ve found a great solution for the wrists and fingers: Burts Bees Poison Ivy Soap. It removes tenacious oils. Interesting, I’ll have to look for that! Monstabunny, you’ll probably never come back to this thread to see this but…you’re a genius! Don’t have the Burt’s Bees, but when I unpacked my daughter’s backpack from her sleepover, I noticed my husband had tucked some Ivy Cleanse towlettes in there. I just made some samples, rather carelessly, so when I was finished, I grabbed one to test your theory. There is NO scent left on my hand at all, save for under the fingernails where I didn’t think to scrub. Brilliant! A perfume kinda-sorta inspired by Scarlett Johansson gets a shiny new commercial and a big launch, while ones inspired by Louise Brooks and Coco Chanel get– sticks! I mean I’m sure these are great but oh man, the disparity is wrong. How amazing would it be if a big niche house did a Louise Brooks fragrance or something. Flapper glamour in a bottle! Also: unicorn chaser. I had to urbandictionary that one, haha. LOL…it’s true. But the number of young people (the audience for this scent, I’d think) who know who LB is can’t be very large! Yum. Review the rest of them now, wontcha’, pretty please? Because I am in danger of ordering several unsniffed, and with your review at least it will only be sort of unsniffed, LOL. A, which others were you after? PomPom Gardenia was a disappointment to me because it was more LOV than gardenia on my skin, and Tamara Charleston I alternately loved and hated…decided in the end that I hated it. Excellent, thanks very much! And what say you of Saigon Rose? Rose Saigon was my 3rd favorite of the group, still, didn’t like it nearly as well as these 2. These are sure cute. I love the whole concept of solids, and the packaging is so darned cute! I’m going to have to explore this line further. I have just tried one of these (a friend sent a small one), and while it wasn’t “me” on my skin, I decided to try it as a car fragrance. I left it open in a warm car today. I wonder how it will work? Let me know…I wonder if it has enough sillage to work that way. Which one was it?? Hi! It is the Les Divines Alcôves “On Cloud Nine”. A white floral, I think. I left it open in the cup holder of my car all day (pretty hot here), thinking it might melt a bit and scent the car, but it really didn’t do the trick. I’m going to leave it in there for a couple more days! Yeah, I’m thinking these aren’t strong enough to scent a car. Maybe you’ll end up proving me wrong though! 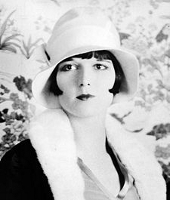 Well, seeing how my NST nickname is Nlb, which stands for “Not Louise Brooks” (although, I certainly wouldn’t mind having even an ounce of Louise Brooks-style allure and personality ;D), trying out the “Chere Louise” is a must. The paper packaging is gorgeous–I’m always drawn to that sort of striking color combination. Seriously, is that what the initials stand for?? Dying to know how you came up with that. It is—a while ago, I made a painting that everyone remarked at with “Oh, it’s Louise Brooks!” As an inside joke, I called it “Not Louise Brooks”. Since the name made me chuckle, every time, I carried it over into a couple of online things ;). Did you try all of them? or Joséphine Jonquille? I like ginger and cardamom and chocolate can be ok sometimes. They were both fine, I just didn’t like them as well as the 2 above. Tamara Charleston was really the only I didn’t like. I ordered the Chere Louise and received it yesterday, and I must say I like it very much! I agree with you that it’s almost, but not quite, a “wood pudding.” Only wish it had a bit more sillage, but then it is a solid! Packaging is too cute. Hello I am a newby here, been reading this blog for a while. Anyway I read this review because I bought Chere Louise recently. You said “I would swear it smells just like some other scent that I can’t pinpoint”…. well my Mum wore Anais Anais in the 80’s and I swear this is very similar! Perhaps it is the Hyacinth?! Fun to make that connection although I found AA sickening in the end, sorry Mum! So Chere Louise gives me a bit of a blast from the past. Hi and welcome! And you could be right, that might be it. Thanks Robin… I am having such a great time with perfume. It all kicked off (sorry, everyone is football crazy right now and it must be seeping into my sub conscious despite my complete disinterest…) anyway sorry to ramble, hmm it was when I was in the UK and I came accross a perfume I used to wear, Eternity; I couldnt resist! Memories came flooding back and I have to say I like it still. Then I tried to test everything I had ever worn, (Miss Worth was my first perfume and sadly you can’t buy it now). White Musk!! Cristalle, Coco, Eau de Lancome, l’eau Issey Miyake… Then I found your blog and voila a whole new world opened up. I have made friends at Sephora! I get them to label my samples, too confusing otherwise. So far I really like L’Artisan Parfumeur’s Ete en Douce and lots of the Hermes line, SL’s Sa Majeste La Rose is heavenly to start with but dries down dusty on me – will keep trying it as I really like roses. I have spent hours reading, testing, gathering samples..